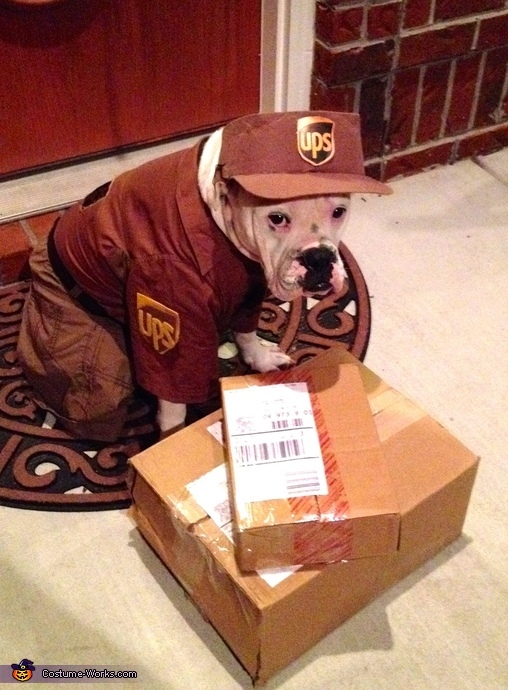 This homemade costume for pets entered our 2014 Halloween Costume Contest. Meet Hank (the tank) ..... In honor of UPS workers worldwide and after chasing down more then a few delivery personnel and a truck or two we felt it was only fitting to have Hank represent his favorite doorbell ringers. Hank resides in Myrtle Beach South Carolina so he has opted for the cargo shorts - complete with sweat rag in his back pocket for our indian summer days. Hank never leaves the house without his hat or his smile!. He will be an asset to any team with his affectionate personality and his eagerness to get things done fast!! Hank is getting ready to celebrate his second birthday next month and is all ready dreaming of the goodies the UPS truck will bring his way !! Too funny, I love this! A great and original idea.Hank is such a handsome boy.